The unit of mass, the kilogram, is the last SI measurement unit defined by a physical artefact, rather than a mathematical constant. In 1889, the 1st General Conference of Weights and Measures (GCPM) adopted the International Prototype Kilogram (IPK) as the definition for the unit, which has remained unchanged until now. In the past, this meant that measuring mass relied entirely on mass accuracy of a physical object, which, even in spite of advanced security measures, has been prone to uncontrollable changes with time. Therefore, a new definition of the kilogram was necessary, in order to ensure the measurement unit is independent from a physical object, and hence fully stable, accurate and accessible, independent of time and location. Scientists worldwide have been involved in this groundbreaking research project to redefine the 1 kilogram. The 1 kg redefinition is part of the biggest overhaul of the International System of Units (SI) since its inception in 1960. 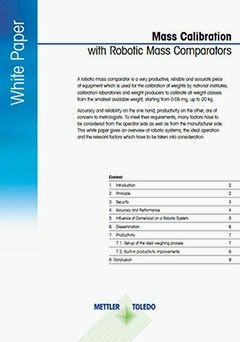 This White Paper explains the background of the 1 kg redefinition and the effect this change will have on the weighing world. 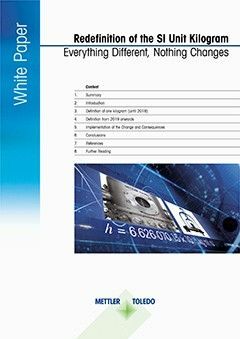 Download the document and learn what steps have been taken so far and how the change will be implemented, together with its consequences. Read the below FAQs and find out, for example, when is the redefinition going to take place, what will happen to the "old" kilogram and what are the consequences for the laboratory or industrial weighing, due to the 1 kg redefinition. 1. Why do we use the word "redefinition"? Each base unit of the SI has an unambiguous definition. The definition of the unit kilogram valid until 2018 is based upon the mass of the International Prototype Kilogram, IPK. Because an artifact is unstable by its nature, work is underway to replace the current definition with something more stable, hence the term “redefinition“. 2. Why is the redefinition of the kilogram necessary? The mass of the IPK stored in Paris is not stable and it is impossible to quantify this instability. The primary standard is only available at the BIPM lab in Paris. To base a global measurement unit on just one artifact is a big risk (damage, loss). Unknown changes in the mass unit also influence the ampere, the mole and candela, which so far depend on the kilogram. The new definition is designed to overcome all these problems. 3. What changes are expected for weighing results? The value of the Planck constant, to which the new kilogram definition will relate, has been chosen so no change in the mass unit will be seen at the time of the redefinition, and weighing results will not be affected at all. 4. Do I have to re-calibrate all my balances to comply with the new kilogram definition? Since the new definition of the kilogram will not change the value of the kilogram unit, there is no need to re-calibrate weighing instruments such as balances. 5. Do I have to re-calibrate all my weights to comply with the new kilogram definition? 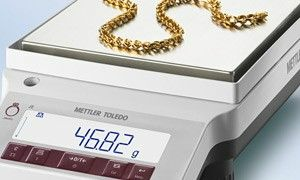 Since the new definition will not change the value of the kilogram unit, there is no need to re-calibrate weighing instruments such as weights. 6. Will the calibration costs increase? The new definition of the kilogram will not have any effect on commercially available calibrations. 7. Since there is no international prototype, will the kilogram still be the same everywhere? The Consultative Committee for Mass (CCM) who are overseeing the redefinition ensure that the unit of mass is equivalent worldwide by a series of key comparisons among national standards laboratories. 8. What are the benefits of redefining the kilogram? The SI unit of mass will be perfectly stable following the redefinition of the kilogram and changes in primary (artefact-based) mass standards (including the IPK) can be monitored against the redefined kilogram (via the Watt Balance or Avogadro experiments). 9. How can one explain the new kilogram definition? When the Planck constant is fixed to exactly 6.626 070 15×10−34 s−1·m2·kg and "s" and "m" are already fixed, then by doing so, "kg" is also fixed. So by using the mentioned value for the Planck constant, the kilogram is defined. 10. What will happen to the IPK? Will it be retired or are there ongoing reference checks between these three methods going forward? As soon as the definition of the kilogram is based on an invariant of nature instead of a material artefact, it will theoretically be possible to realize the SI unit of mass at any place, at any time and by anyone. Thus, the IPK will be functionally retired as definition, but physically still be used in experiments as check standard. 11. When is the redefinition of the kilogram going to take place? In November 2018, the CGPM (General Conference on Weights and Measures) is expected to formally adopt the new definition of the kilogram and it will be practically implemented from May 20, 2019. 12. How is the Planck constant linked to a weight piece in practice? There are two physical laboratory experiments to realize the kilogram with reference to the Planck constant; the XRCD (Avogadro) sphere experiment and the Watt Balance (Kibble Balance) experiment. When the fixed value of the Planck constant is used in the calculations, with the help of these experiments, the mass of a physical body can be determined. 13. Is there any change expected in industrial or laboratory weighing due to the re-definition of the kilogram? Do we need to adapt our SOPs? The re-definition of the kilogram affects only the realisation of the unit kilogram which is the very beginning of the traceability chain. All other calibration procedures remain unaffected, such as the calibration of weight pieces or the calibration of weighing instruments like balances. 14. Will calibration uncertainties be the same after the re-definition of the kilogram? 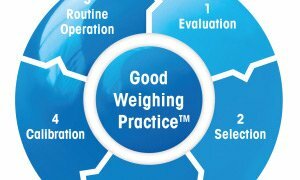 When designing the new definition of the kilogram and acceptance criteria for its implementation, special care has been taken that no significant increase of uncertainty happens along the calibration chain. 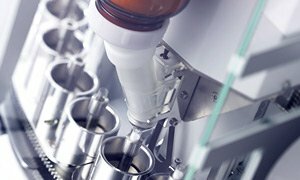 While there is some increased uncertainty at the beginning of the traceability chain, this will be taken into account by national measurement institutes and the uncertainties on calibration certificates for weight pieces and weighing instruments will not be affected by the redefinition. 15. Are there any drawbacks of redefining the kilogram? At present, there are several unresolved issues with the potential redefinition of the kilogram. The uncertainty with which the mass scale can be realised will increase from zero (the current "uncertainty" in the IPK) to 2 in 108 (the target uncertainty for the redefinition experiments). This increase in uncertainty is equivalent to 20 µg on a kilogram mass standard. A further issue is that both the XRCD and Kibble Balance realisation experiments work in a vacuum, whereas the present mass scale is realised and disseminated in air. This vacuum/air step will add a further uncertainty component to the dissemination of the unit as it is known that vacuum/air transfer of mass standards changes their mass value. 16. Which one is the better realisation; the Silicon Sphere or the Watt Balance? Both experiments are suitable. In fact, it was a condition for the re-definition that two types of experiments deliver consistent results. Both experiments are considered valid ways of implementing the new kilogram definition. 17. I use balances in "legal for trade" applications. Should I expect any change by the re-definition of the kilogram? Since the new definition of the kilogram is not designed to change the kilogram unit, there is no need for any action. 18. If the realisations of the kilogram are performed independently in many laboratories worldwide, how can we be sure that a kilogram is the same everywhere? This question is not specific to the kilogram: National Metrology Institutes regularly participate in intercomparisons to ensure that all measurement units are globally consistent. Special care has been taken in the case of the kilogram to ensure consistency in the starting phase of the new definition and its implementation. 19. Are there only two methods for realizing the kilogram? The condition for a method to realize the kilogram according to the new definition is that it uses the fixed values of the natural constants of the SI. At the moment two methods are known to fulfil this requirement, these are the Kibble (Watt) Balance and the XRCD (Avogadro Sphere) method. In the future, other methods might be developed, but they are not known today. 20. How does the Kibble Balance work? The Kibble Balance equates mechanical and electrical power experimentally (hence the alternative name "Watt Balance"). It is operated in vacuum and links the mass of a weight piece to the Planck constant. 21. 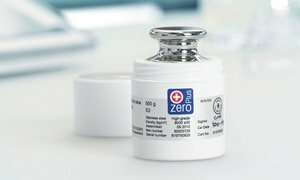 How does the XRCD experiment work? Basis for the XRCD (Xray Crystal Density) is a monocrystalline and monoisotopic silicon sphere. Its mass is determined by calculating the number of atoms in that sphere and determining the mass of the sphere via fixed values of Planck- and Avogadro constant and the electron mass. 22. Will only a limited number of labs maintain these methods in their labs or is it envisioned that many W&M bodies use them? Both the Watt/Kibble balance and the Avogadro/XRCD experiment require a significant amount of resources in the labs. It cannot be pre-determined, how many laboratories will decide to maintain their own experiments and at which level of quality in the future. Avoid data entry errors and weight mix-ups. 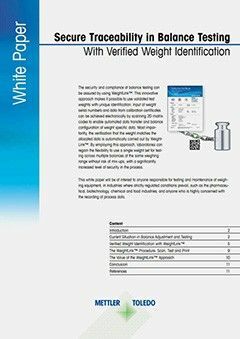 WeightLink™ allows fast, secure testing with verified weight identification. 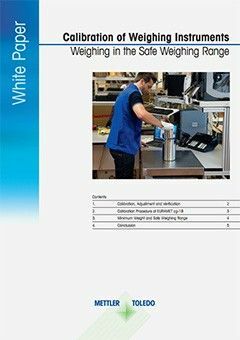 Learn how calibration data establishes minimum weight and safe weighing range, to ensure quality requirements are met.